Mary "We really enjoyed the 3 day trip. Robert was a great tour guide with a good sense of humour and the ability to incorporate us as a group. The Warmanbool hostel was quite good including the reasonable bar! The Halls Gap hostel was very basic but formed part of the variety of the tour. I felt the walk up to the Pinnacle was more strenuous than advertised however I am glad that I achieved the climb...."
Start in Melbourne and end in Adelaide! With the discovery tour 3 Day Melbourne to Adelaide Tour via the Great Ocean Road and Grampians National Park, you have a 3 day tour package taking you from Melbourne to Adelaide and through Melbourne, Australia and 6 other destinations in Australia. 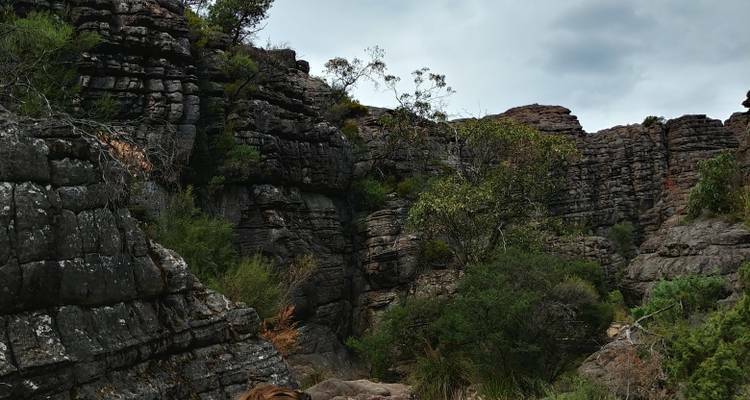 3 Day Melbourne to Adelaide Tour via the Great Ocean Road and Grampians National Park is a small group tour that includes accommodation in a hostel as well as an expert guide, meals, transport and more. Had a really fun time and I felt it was a great value for what I paid. I would have liked to spend a little more time exploring the small Surf towns instead of driving through. A great guide! Fun, hard working, knowledgeable and really went the extra mile for us! Quite witty and gave great service! Glad you enjoyed your tour! Overall the tour was really good. We saw all the best places in the Great Ocean Road and our guide was really informative. The only thing that let it down was the second hostel. There was only one bathroom between fourteen of us, and it was quite cramped. Your coach will arrive in Adelaide between 7 - 8 pm on the last day of the tour. There will be no included accommodation booked for this night so you will need to ake accommodation arrangements. The tour starts in Melbourne, where you will be picked up from a choice of pick up points listed in your trip documents. The pickup time will be between 7 and 7:30 am. Melbourne is the starting point and Adelaide is the endpoint. TourRadar only requires a deposit of $99 to confirm this Wildlife Tours Australia booking. The remaining balance is then payable 60 days prior to the departure date. For any tour departing before 22 June 2019 the full payment of $264 is necessary. No additional cancellation fees! You can cancel the tour up to 60 days prior to the departure date and you will not need to pay the full amount of $264 for 3 Day Melbourne to Adelaide Tour via the Great Ocean Road and Grampians National Park, but the deposit of $99 is non-refundable. If you cancel via TourRadar the standard cancellation policy applies. Some departure dates and prices may vary and Wildlife Tours Australia will contact you with any discrepancies before your booking is confirmed. Covering a total distance of approx 836 km. TourRadar does not charge any additional cancellation fees. You can cancel the tour up to 60 days prior to the departure date. If you cancel your booking for 3 Day Melbourne to Adelaide Tour via the Great Ocean Road and Grampians National Park via TourRadar the standard cancellation policy applies.